The organ of propulsion for crocodilians is their tail, for swimming. The limbs are relatively small. The forelimbs have five fingers, with no webbing between them. The hind limbs have four prominent toes and the rudiments of a fifth. Three of the toes are clawed, with strong webbing between them. When swimming, the limbs are held against the body, and the swimming action is an undulating wave from the head to the end of the tail. However, when diving, the front limbs are lifted up almost vertically, and protrude well above the level of the shoulder. This is an action that directs the head downward. The hind limbs are sometimes used as stabilisers. Crocodilians floating or swimming very slowly will often have the hind limbs splayed out in the water with the toes and toe webbing extended. The head is on the surface, but the body lies almost vertically in the water. An upward movement of the spread limbs and the crocodile submerges rapidly backwards, with barely a ripple. Movement on land is a cumbersome affair. Crocodilians tend to avoid long-distance movements over land, but occasionally are forced to do so (eg when waterholes dry up). Some species (eg Australian Freshwater Crocodile, Mugger Crocodile and caimans) regularly move overland between drying pools, whereas most species tend to select habitats where there is deep and permanent water. Crocodilians rapidly become exhausted when moving on land, and must frequently stop and rest. "High walking" is the most common gait. The limbs are held erect beneath the body and the tail drags as the animal walks at about 2-4 km/h. When crocodilians need to move rapidly on land, usually to get back to the water, they often use a sprawling gait in which the front and back legs on one side meet when the body curves in that direction, then separate when the body curves in the other direction. The tail thrashes from side to side in synchrony with these movements. When coming down steep, mud banks, crocodiles sometimes just slide, dragging their limbs, while the tail moves from side to side giving extra propulsion. The most spectacular gait is galloping, but few species appear to use it. 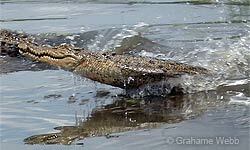 Australian Freshwater Crocodiles gallop almost every time they need to move rapidly on land. Galloping allows animals to jump over rocks and logs between them and the water. The front limbs go out and forward as the hind limbs propel the body forward. The tail tends to move up and down rather than from side to side. 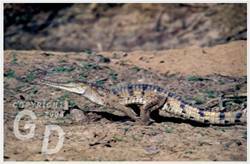 Maximum speed attained when galloping is about 18 km/h, although crocodiles become totally exhausted before they have covered 100 m.
K. Richardson, G. Webb and C. Manolis (2000): “Crocodiles: Inside and Out” (Surrey Beatty and Sons: Sydney).